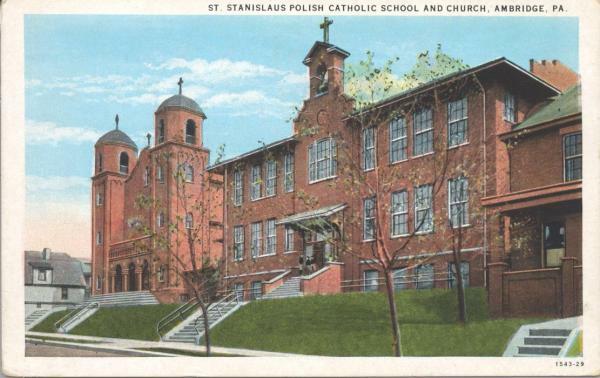 St. Stanislaus Polish Catholic Church and School, Ambridge, PA, circa 1910. Ethnic Catholic schools sprang up wherever the so-called new immigrants settled in industrial Pennsylvania. Tested by the pre-Civil War riots, the Catholic system of parish-based parochial schools flourished at the end of the nineteenth century. Critics continued to complain that separate schools reinforced un-American loyalties, but champions of the parochial schools blended a defense of the faith with an ardent enthusiasm for American ways. By the late twentieth century, demographic changes and the fall off in church attendance made it impossible for many parishes to maintain their schools.